Today... well yesterday since it's 1:30am... After looking for a wedding dress my mom and I picked up Matt and we went to Atria's Restaurant & Tavern for dinner. They are celebrating Oktoberfest, which we all ended up order from the Oktoberfest menu. We all started with a soup. My mom got the Sherry Crab Bisque and Matt and I got the Allgäuer Käsesuppe soup. It is a creamy Bavarian cheese soup with whipped cream and croutons. All of our soups were really good. For our entrees my mom ordered the Wiener Zwiebel Schnitzel, tender hand breaded veal medallions with crisp fried onions served over traditional German potato cakes.She said her veal was very good and tender. Matt ordered the Famous Jägermeister platte, grilled bockwurst and knockwurst with roasted pork loin, kraut spätzle, hot German potato salad and a shot of Jägermeister. He wasn't too thrilled with the bockwurst and knockwurst, he said it tasted like hot dogs, but really liked the kraut spätzle. I did try a piece of his knockwurst and the knockwurst we had a Max's Allegheny Tavern was better. For my entree I ordered Paprika Händel, hand breaded, fried chicken breast with fresh peppers in a creamy paprika sauce served over käse spätzle. Which I though was pretty good. So, your probably asking, where are the pictures? 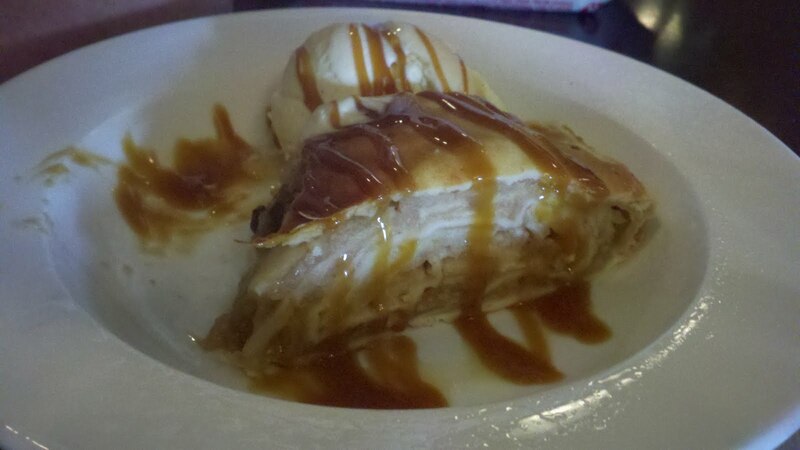 Well I forgot until we got to dessert! My mom and I ordered the Schwarzwälder Kirschtorte aka Black Forrest Cake. 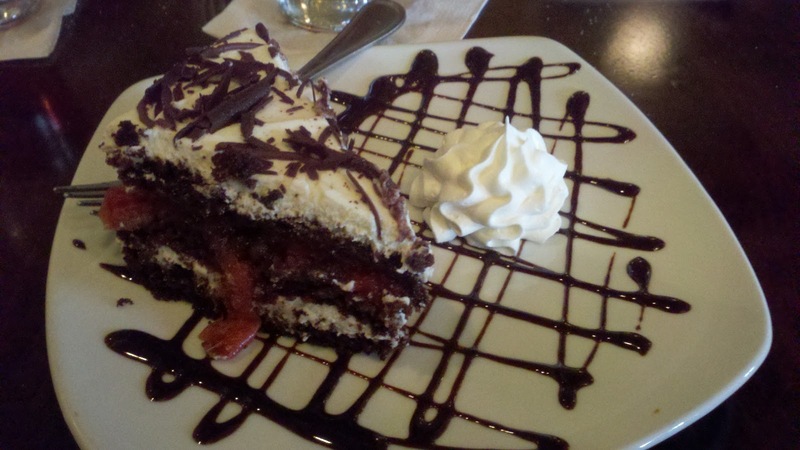 Which was a meal in itself but was really good... Also my mom's favorite cake :) My mom also order a coffee with dessert. which has her approval and was really smooth. 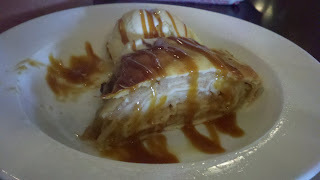 Matt ordered the Ofenfrischer Apfelstrudel aka apple strudel with french vanilla ice cream. He thought it was ok but tasted like it was previously frozen.